He might normally have a bigger job, but on Tuesday, Barack Obama was President of the Jersey Shore (PORJUS? ), as he spent some time on my beautiful state’s boardwalks and beaches, before delivering remarks in front of an uproarious crowd at the Asbury Park Convention Hall. After a warm introduction by Governor Chris Christie, the President did what New Jersey really needed him to do: let the world know that the state’s Hurricane Sandy-ravaged shore is open for business, and continued his political romance with the Governor, or “Chris,” as the President calls him. Obama and Christie then paid an unannounced visit to the Point Pleasant boardwalk. They looked at a giant sand sculpture in progress on the beach (so far, it’s just a wood frame with scaffolding all over it) and talked with the designer, Ed Jarrett. Jarrett told the president he is building it from “top to bottom.” The town is going for the Guinness record for sand castles, several folks gathered on the boardwalk said. The party then moved to an arcade called “TouchDown Fever” to try and win a stuffed bear by tossing a football through a tire. Obama tried and missed a few times. Christie then threw the ball through the tire, on his first and only try. Obama gave him a high five ending in a clasp. And said, “That’s because he’s running for office.” The guy behind the counter gave Obama a “Chicago” bear. 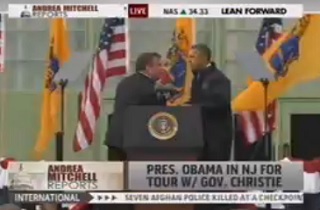 Obama and Christie shook hands on a rope line. At one point, potus just held up both hands while tons of kids slapped him five. The skies were cloudy and it drizzled on them the whole time. The two lingered on the board walk while the pool went back to the vans to hold. And then they did a Roustabout duet. It was on to Asbury Park, then, where according to Hayes, the President received a warmer welcome than he did from the bait-shop guy. “On 5th Ave in Asbury Park a man held a picture of Obama and another had a sign around his neck ‘Welcome to Jersey President Obama,'” Hayes reported. Governor Christie warmly introduced the President, who got huge applause from the Asbury Park crowd, and in turn, worked that crowd for all it was worth, name-checking shore towns and attractions. The ten-minute speech was mainly devoted to reminiscing about his magical afternoon with “Chris,” and the awesome, fully-operational Jersey Shore that enabled it.